It gives the option to extend HTML attributes by the use of Angular directives. Two-way data binding is at the core of Angular.js. This essentially takes away all the pain of writing manual code for DOM manipulation. Angular 2 final version was released on 2016. It was completely re-written, also focused for mobile apps development and was a big success. From 2016 to 2018 it has graduated further to Angular 6 as a great improvement over old. Angular 7 is slated to be released in September or October 2018. It is almost guaranteed to become the enterprise framework of choice once it is released. EmberJS competes with the likes of Angular and React when it comes to building interactive frontend user interfaces and also has a very active community of developers. Ember also rides on the principle of two-way data binding like AngularJS. Ember targets the best of both AngularJS (two-way data binding) and ReactJS (server-side rendering). In the next 12 months, the framework is set to change beyond recognition. One would argue this is a positive & exciting problem to have. Of course, it is. 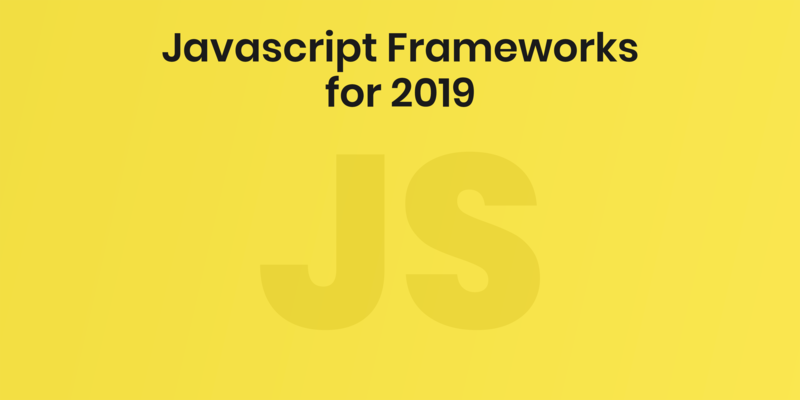 By 2019, I have no doubt our framework will have been virtually reborn, offering a new & improved developer experience for those who already appreciate Ember, whilst also being capable of compelling React/Angular/Vue developers to dip their toes into the Ember ecosystem. However, for those existing Ember developers, there’s a long road of instability ahead. When we google for Node.js web frameworks, surely we come across Express.js very often. Express.js is among the top Node.js frameworks. Used for an efficient platform for building robust applications and APIs, Its one of the four components of the well-known MEAN stack (MongoDB, Express, Angular, and Node.js) which is a toolset that is very frequently used for building web applications. Here Express serves as a middleware between the front-end, database, and back-end of an application. It is very flexible and lightweight and offers excellent possibilities in terms of using plugins, extensions and third-party databases. Express.js is often referred to as the server framework for Node.js, as it creates an HTTP server for Node.js and supports the middleware functionality needed to respond to the HTTP requests. It has a superb set of documentation and enjoys great community support. Sails.JS make it easy to build custom, enterprise-grade Node.js apps. It is designed to mimic the MVC pattern of frameworks like Ruby on Rails, but with support for the requirements of modern apps: data-driven APIs with scalable, service-oriented architecture. It’s especially good for building chat, real time dashboards, or multiplayer games. It is popular in developers as it holds many ends for them in developing.